Behold, our first home-cooked meal in the French Quarter in New Orleans. Pour a little olive oil on the pork chops. Rub both sides with coarse sea salt and crushed black pepper. You'll need fresh sliced or pressed garlic and tons of fresh Italian Parsley. (Very Important: has to be Italian Parsley.) Don't put the parsley or garlic on until you've grilled one side of the pork chop. When you've grilled the first side, flip, then smother with garlic and parsley. I say this because you don't want that parsley falling into the grill, but you also want the parsley to sort of cook. Try, if possible, to grill the pork chops on a New Orleans balcony overlooking hopefully Decatur Street or similar. And if you can, get a single clarinet player to serenade you with some soft, distant jazz. We served with beets, which I sliced and sautéed for about ten minutes in olive oil, butter, coarse sea salt and crushed black pepper, and a salad of greens, tomato, avocado, cucumber and dressed with a vinaigrette made with olive oil and balsamic vinegar. Please serve with a wonderful White Zinfandel, but you might want to make sure you have enough wine glasses for all involved...as you can see, Summer and I have to rock-paper-scissors every night for the one wine glass. "I think I made an underwear mistake today." "People were smoking on us." "I can't believe you walked home barefoot. Because, you're not. Me." "$3.60??? That's unacceptable!" --reacting to the price of a triple shot of espresso over ice with one pump of mocha at Starbucks. "I feel like I don't deserve to wear these clean clothes -- that's how gross I feel." Taken just after her Marilyn Monroe-ment when the breeze came up and so did her skirt. Want some "Kady-isms?" Check Summer's blog here. I get to say, "yes ma'am", and "yes sir" whenever somebody finishes a sentence. I get to call ladies by "miss-and-then-their-name", like "Miss Annie" or "Miss Ruthie". I have a free apartment in an amazing neighborhood with a free car parked outside and free food in the fridge. A man on a bicycle will deliver mac & cheese, shrimp po'boys and crab cakes right to your door. You can buy alcoholic beverages in drive-up windows. I have a grill on my balcony. 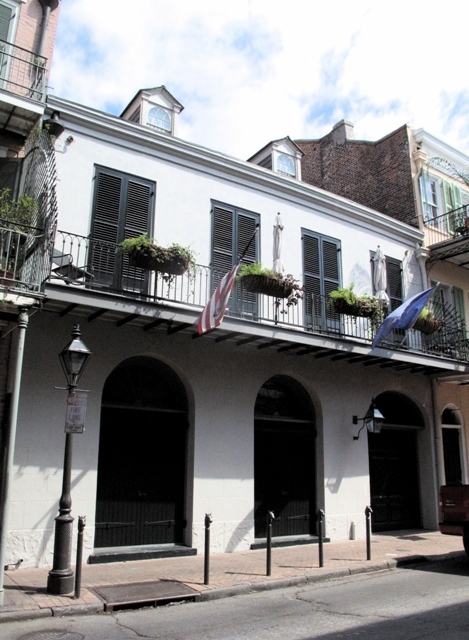 You know, the New Orleans balcony, with the lonely jazz music playing in the soft distance? The man on the bicycle will deliver beer too, if you ask him to. Summer and I saw three rats yesterday (way too close to our apartment), and I've been yelled at by no less than six homeless people. Most houses still have the markings from spray-paint identification. To read a great article about these markings, and see more photos, click here. Just being here has been an emotional experience. I have gotten used to hearing a lot of tragic stories out in the field every day at work, since everyone has a Katrina story, and they share them with you. Some stories are both horrifying and inspirational. But nothing prepared me for what I heard today. Miss Annie and I were stopping at our last device-repair with a man in the lower 9th who told us that his son was murdered two years ago. He pointed behind us to two bullet holes in the wall and explained that his son fell right where we were standing. Somebody just came to the door and shot him. "Youngsters these days, they'll kill you for nothin'. Nothin'". I didn't know what to say. And it gets worse. Just one year after the murder, this man's wife died in the hospital and five months after that, his other son was mugged while driving a delivery truck and shot, for his empty wallet and gold necklace. "I don't know. But I can tell you all my jokes today bombed." "I loved that elementary school. I was the queen. And Justin was the king." "My fingernails are always disgusting." "And when I say one hundred...I mean forty." "I think between you and me we can figure out what to put bacon in." Ran across this one during work the other day. Couldn't help but stop and take a photo. Well now it has become a great new catch-phrase for when I'm eating (have you seen me eat?...it's fast), because today at breakfast Ashley looked at me, disgusted, and said, "Kady! Slow yo' roll." I arrived in New Orleans last night at 10:30pm. Rented fabulous new company car. Got lost in a sketch neighborhood. Locked doors at an awkward moment between me and a dude yelling at another dude. Told a bum I didn't have any cash and please don't help me with my luggage. Met Summer and Ashley and Edie, watched some Project Runway. Slept on uncomfortable too-short couch, since landlady inexplicably still lives in what is supposed to be my bedroom. Learned that we do not say "B" at work. We say "Bravo". We do not say "F". We say "Foxtrot". Had first (and definitely not last) fried shrimp po'boy for lunch. Accidentally made fun of boss' accent. By repeating his exact phrase about Walmart in a mocking tone. Finally the landlady moved out. Our apartment couldn't be more adorable. Summer is purposely making a weird face here, if you were wondering. Had rabbit and shrimp jumbalaya, deep fried oysters and crab claws, a beer and went to bed. If you don't hear from me in a few days, it's because I MOVED TO NEW ORLEANS WITH MY BEST FRIEND SUMMER. "Oh my God...this is not a real place. This is not a real place! It's amaayzing. I'm...this...is not...real life...OK...love you...I just pulled up, met Donna, she's adorable, and I'm walking Edie just to find some grass and I feel like we're in another country, this...is gonna be so...fun...OK love you bye." Goodbye, Hal and Dianne. Love you! A gentleman asked me for some Heinz 57, just as I was pulling it out of my apron for the table. Before he saw it in my hand, I quickly did the "pull a quarter from behind the kid's ear" trick, only it was a Heinz 57 bottle and a man's ear. *I perfected this one last night with a lady. First I said, "I'm sorry, there's something behind your ear." and then produced the bottle. I dropped a drink behind the bar. Luckily the glass didn't break, but there was a mess of ice and liquid all over the floor. Bend over and wipe it up? Not me. Instead, I threw two towels on the floor and skated around, finishing off with a nice Michael Jackson Moonwalk. My neighbors and my mom and dad came out last night. My dad put his cowboy hat on his seat for storage. After I took everybody's food orders, I bent down, lifted the hat slightly and asked, "and for you sir?" A man was bellied up to the bar and asked if we had personal sized pizzas because he was starving but didn't want a whole pizza. We didn't, so he decided on a whole pizza. He asked how long it would take. I told him ten minutes, ran back and threw one in the pizza oven, which, I didn't realize, shuts off automatically at 11pm. When I went back to check on it, I ended up having to move the pizza to a toaster oven. I came back out and told him 5 more minutes. He was like "WHA? ", cuz he was starving. But he was a good sport and we were laughing about it. When I gave him the 2 minute mark he said, "you know what? just bring it out. As is." So I did. And luckily it was perfectly cooked. But just to make sure the mood stayed light, I delivered it with a bite taken out of one of the pieces. "I'm living proof of how stupid I get." "We got a beautiful weekend...why are we wastin' it in here?" "Now listen, you been tellin' me to shut up all night. It's my turn to tell YOU to SHUT UP." ...A couple weeks ago I was bartending and a large group came in just as I was about to call it a night and lock the doors. Dang. Anyway there were a couple different groups, actually, and Group A was celebrating the birthday of one of its members. Groups B, C, and D thought that was pretty awesome and there were rounds purchased and congratulations offered. And then somebody thought it would be a great idea to bust out the Happy Birthday song. When this very loud group got to the <insert name here> part, you know..."Happy Birthdaaay, deaaar ........" they just kinda did the hmmm hmmm because of course, nobody knew the guy's name. I saw it coming...I couldn't help myself...I screamed out "WHATS-YOUR-NAME" during the awkward silent pause. "When's the last time you been picked up by the seat of your pants and the scruff of your neck and been suitcased out the door?" "I had cancer. And I didn't see any Splenda on that thing when they took it out." "Why would anybody want to pay thousands of dollars to look at a bunch of old farts in wooden shoes?" "Why not just go, start up your cloggin'." Seriously, I don't know why the H~ I'm moving. My parents take SUCH good care of me. I don't pay rent, and here's what I get for my money: My dad goes to the store and gets beer for me, vacuums out my car and fixes all things broken. My mom does all my laundry and folds it and places it on the ladder leading up to my adorable loft bedroom. She cooks all my meals, makes coffee, and even has drinks waiting when I get home from a long night at work. The other night I nodded off without finishing my beer and when I woke up she asked if I was ready for it again. Here she had corked it and put it in the fridge for me! I leave Northern Minnesota on Tuesday. 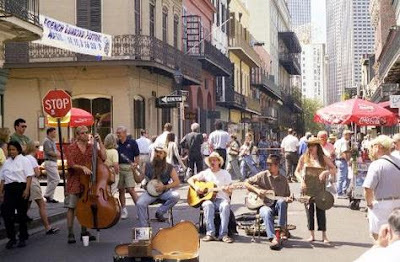 Summer and I took a job that will have us in New Orleans through September and then somewhere near Daytona Beach, Florida from October through December. When I told my dad I was moving, he started getting mad. I told him, "dad, I'm 34. I'm supposed to move out." ...and I avoid winter for at least four more months. Yesterday at work, I went to the co-ed employee bathroom. Whilst in there, I noticed a tampon applicator in the garbage. The paper here, the applicator there...with no effort whatsoever to cover them up. No toilet tissue wrapping, no shoving it down in the garbage, no nothing. It wasn't mine. But somebody might see me leave the bathroom...and think it was mine. So here I was, shoving paper towel on top of it and smooshing it down into the bin. And I didn't even do it! Part of being a woman around a bunch of guys is accepting the fact that the assumption will be...the tampon is yours. Hundreds and thousands and millions and trillions of tampons. Completely filling the hole in the ground. She was horrified. But it wasn't her! Logically, you can't produce that many in just one month! Try explaining that to a bunch of dudes. She just shrugged her shoulders and went back in the house, branded forever the girl who flushes tons of tampons. Cascade Bay Water Park, Eagan MN. $9 entrance fee (cheap!). Tons of water slides, plenty of sun and a lazy river. You can spend the whole day just afloatin' down the lazy river. I remember when Murphy was a little baby boy and we'd float and float and sleep and sleep for hours. And now he's nine years old. Gosh. This is the water slide you can go down right on your tube. When Miles was a little baby boy and we were stuck in a long line at the top of this slide, he had to go pee SO bad and we kept saying wait wait wait we'll go to the bathroom, wait dude, just another minute, but he couldn't and just peed right at the top poor thing. So yah, there's probably a high pee content at this place. The only thing I might change is how they don't let you float and float and float while drinking beer. "When you start looking for a wife, here's what you look for. Trust me. I know this, I have kids. First, no illigitimate babies. Second, no student loan debt. You marry somebody with student loan debt, guess what? you're gonna be stuck paying it off. Third, no credit card debt. You marry somebody with credit card debt, guess what? you're gonna be stuck paying it off. Fourth, no midgets in the family. What?! You think I'm kidding? You don't want midget babies. Trust me." Now it has become the catch phrase in life for when somebody is totally not drunk, but you accuse them of it anyway to be funny. You can use it too. It's my gift to you. "Have another White Russian, KASEY!" 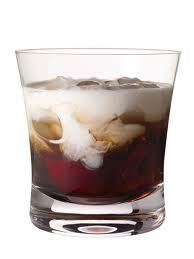 So lately the White Russian has become my favorite drink. I am hooked! I love them. You just do equal parts Vodka and Kahlua and a splash of cream. Delish. 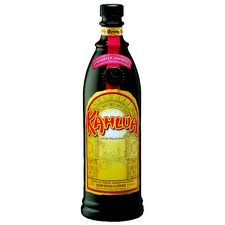 The other night I used up the last of the Kahlua and so today when my mom and I were at the liquor store, I asked her if she wanted me to replace the bottle. "No! ", she said, "We never use it. I bought that in Cancun." "MOM!!! You could have told me before I drank it!!" "Well, you're not dead are you?" My Mom and Dad and I went to the Roosevelt Steam and Gas show on Saturday and got to see a bunch of cool old tractors and steam engines. They had a parade and a demonstration and kids games and my favorite meal, the Taco in a Bag. Highway robbery at $4.00, but I digress. This, I didn't get, an old, unworking water pump, with a basin filled with dirty water that we were instructed not to drink. How about just not putting water in it? We even got to see old steam engine equipment removing the chaff from wheat. But first I was crowned "Miss Wheat Steam and Especially Gas". "Thank you for the flooowers. Thank you for the flooowers." So you know the old saying, 'give a man a fish and he eats for a day, teach him to fish and he eats for a lifetime'? Well, I'm about to teach you to fish, so listen up. And this trick is so fun I'm giving this whole post the 'Currently Obsessed With...' label, because I'm currently obsessed with it! And you got yourself a not-so-tasty treat. Warning: not for "Gluten-Intolerants". See ya next year, boys! I Was Such a Cute Pre-Teen. Ew. Seriously, Who Breaks a Toilet Seat?